Bay Cay as seen from Horsestable Beach, North Caicos. You’ll definitely want to visit the end of this peninsula and take in the vistas at the channel that separates North Caicos from Bay Cay. For actual swimming and snorkelling, Horsestable Beach comes up short when compared to the other North Caicos beaches. The amazing Greenwich Creek and Bay Cay. Horsestable Beach (also known as Horse Stable Beach) continues to the east from where Whitby Beach ends. The western side of this beach is quiet nice albeit a bit rocky, however, the eastern end of this beach is spectacular. Several rental vacation villas are located on the western side of this beach, but the area is nevertheless secluded and generally deserted. The far eastern point of Horsestable Beach is one of the most scenic spots in the Turks and Caicos Islands. Here, the channels of Greenwich Creek split North Caicos, Bay Cay and Major Hill Cay. 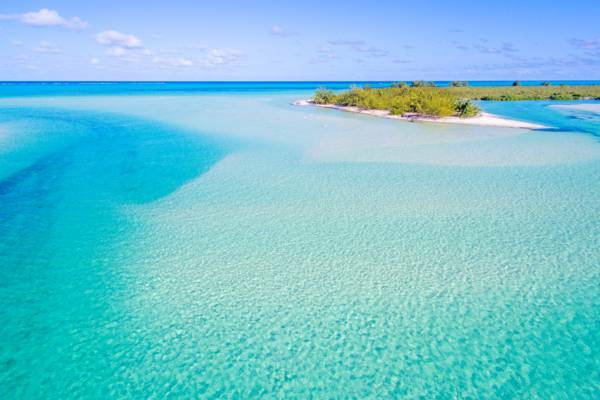 The shallow water, sand bars and channels create amazing turquoise and blue hues. 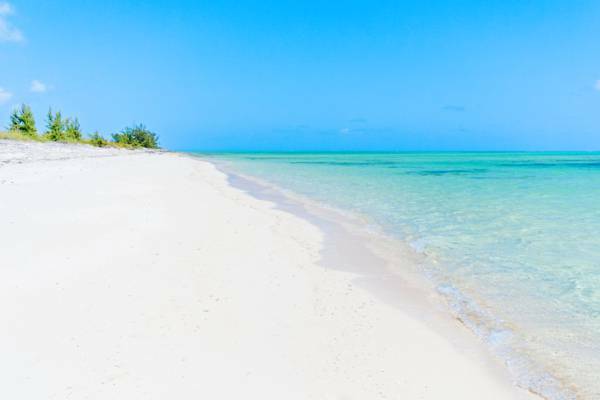 In the shallow water off the beach, small sand bars, made of pristine white sand, gradually shift depending on weather conditions. Wildlife is abundant as well. If you spend a little time in the area, you’ll spot pelicans, ospreys, egrets, stingrays, and possibly juvenile lemon sharks. It’s easy to overlook the road that leads to Horsestable Beach. Follow Whitby Highway. Between the settlement of Whitby and Major Hill, and .75 miles (1.2km) after Flamingo Pond Overlook, turn left onto the paved road at the Y junction (at Victoria Gift Shop). Continue for .4 miles (.6km), then turn right onto the unpaved and sandy road (this turn is before the dock and abandoned community centre at Whitby Beach). This 2.3 mile (3.7km) road leads to Greenwich Creek, and accesses to Horsestable Beach can be found at several location along this route. Although unpaved and sandy, the final beach road is suitable for any car. Horsestable Beach is the northeastern most beach on North Caicos. A couple decent snorkeling spots are found close to shore here. This access leads to the west side of Horsestable Beach. This highly scenic area offers shallow water, sand bars and turquoise channels.